None of the six captain’s picks for the Ryder Cup are wrong, at least not yet. The six players selected by European and American captains Paul McGinley and Tom Watson, were for the most part, not surprises and none of them are bad players. What they are though, at least when it comes to Watson’s American side, are predictable picks of familiarity, and really, the American captain had little other option. It’s no secret that Europe has pretty much dominated the Ryder Cup over the last two decades and when you look at the rosters that have been assembled, it’s difficult to put a ton of faith in an American uprising against a European side that includes four of the top five ranked players in the world. Even McGinley’s captains picks, where he selected Ryder Cup icons Ian Poulter and Lee Westwood along with European Tour veteran Stephen Gallacher, seem like options that were far better than what Watson had to choose from this time around. Poulter’s a match play ace with a 12-3 overall record in the event, and as you can see above, just might be a little nuts. Westwood’s seen as the “veteran leader” of the team, and even if his form hasn’t been great, his skills as a ball striker are always coveted despite the fact that he’s one of the worst players in the world around and on the greens. Gallacher, fighting for a place on the team and the chance to play in his home country, basically forced McGinley to take him instead of Ryder Cup legend Luke Donald with his performance over the last couple of months. These three join a loaded roster that includes names like Rory McIlroy, Henrik Stenson, Sergio Garcia, Martin Kaymer and Justin Rose. McGinley, aside from the difficult phone call to Donald, had it pretty easy in the sense that no matter what he did, he wasn’t going to pick a player that didn’t belong in a Ryder Cup side. 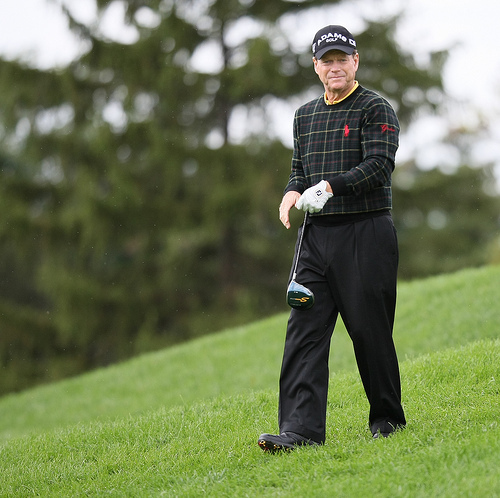 With Dustin Johnson, Jason Dufner and Tiger Woods all unavailable for a variety of reasons, there were calls for fresh faces to be part of Watson’s final three. After his win in Boston, there was tons of support for Chris Kirk. Will Gray suggested Brooks Koepka. Both myself and Richie Hunt from GolfWRX put it out there that Kevin Na would be a good selection and it seems like every professional golfer born in the United States was propped up in recent weeks as a potential option for Watson and his staff, with some of the worst logic behind the suggestions. Mark Rolfing on NBC all weekend suggested that Chris Kirk should be thought of for a spot because he played well with Rory McIlroy in the final two rounds in Boston. What? None of this is done to disparage players like Kirk or Russell Henley and Brendon Todd, who are fine PGA Tour players but when you look at the list of options that Watson had available to him, it’s no wonder that he kept Tiger in the back of his mind until the very last moment. Over the last few months, I’ve suggested names like Billy Horschel and Gary Woodland simply because they are potential game breakers; guys who when they play well, are very difficult to beat, but those performances are few and far between, and when you compare them to the names from Europe, they fall woefully short. Kirk has had a good year, but taking someone like him on the basis that he just won the Deutsche Bank is foolish. This isn’t 2012 when Davis Love could have picked someone like Rickie Fowler and went with familiar names in Jim Furyk and Steve Stricker. Watson is looking to win this thing in a few weeks and even though the odds appear to be stacked against him, golf match play is arguably the biggest crapshoot in all of sports. He could have taken a flyer on a guy like Na or Koepka, but after waiting twenty years to get another shot at this, he wasn’t going to go with guys who might give the United States a better chance of winning at home in two years or the guys who happened to make a few more birdies over the last couple of weeks in the FedEx Cup Playoffs. His job is to pick the team with the best chance of winning in three weeks, regardless of how predictable the selections may have been. Watson went with what was familiar and after everything that has happened to his team over the last few months, he really had no other choice.